This formula consists of an easy-to-digest blend of carbohydrates that are gentle on babies\\' tummies. It provides DHA & ARA (17 mg DHA & ARA per 100 calories), which are naturally found in breast milk for baby\\'s brain and eye development, and Iron fortified for brain development and overall growth. This formula is Kosher and is the first FDA Approved sensitive infant formula that is certified organic for moms with a fussy baby. 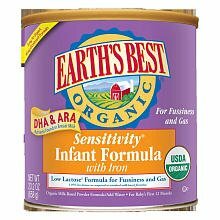 Earths Best Organic Vanilla Toddler Formula Powder, 23.2 Ounce -- 4 per case.